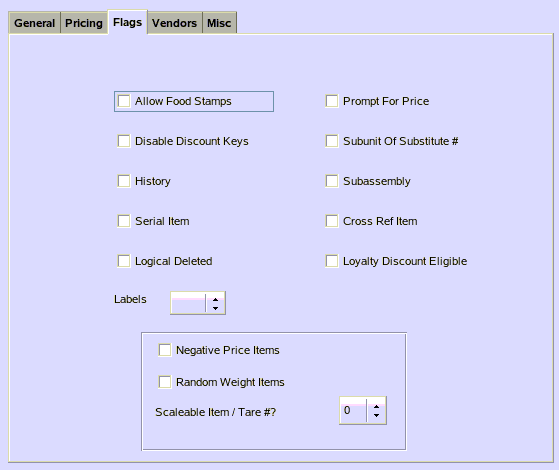 TravStar1 Point Of Sale SystemManager's Work Station GlossaryWhat Are Item Setup Fields? What Are Item Setup Fields? Department – This field is used to place the item into a department so that data can be collected about its sales. Substitute # - Use this if there is no defined plu number (in the case of cigarette carton, this field will have the PLU number for the corresponding pack of cigarettes). Product Group - 3-digit alphanumeric field that allows the ability to break items down farther such as cigarette packs from carton. Manufacturer – This field is used to represent the manufacturer for the product. Vendor – In this field select the vendor that the item was delivered from. Taxable – Check this box if the item is taxable. Purchase Cost – Enter the purchase cost of the item here. Tax Code – Enter the applicable tax code in this field. Conversion Unit – Check this box if you want the received goods converted to a single unit quantity in your inventory upon accepting receipt of goods. Purchase Unit – In this field define how the item is purchased (E.g. Gallon, Quart, Pound…). Sales Unit – In this field define how the item is sold (E.g. Gallon, Quart, Pound…). Standard Order – On hand: This field shows how many are present in inventory. On Order: This field shows how many of the items are on order. W/A Cost – This field takes the cost of goods available for sale and divides it by the total amount of goods from beginning inventory and purchases. Sale Cost – Use this field if you are creating a sale on a vendor price. GM % - This field will tell you the Gross Margin % of the sale that is selected. Begin Date – Enter the date that the sale begins in this field. End Date – Enter the date that the sale ends in this field. Retail Pricing – Use these options to set up price levels for inventory. The default price level will be price level “A”. Level – Represents the 6 different price level options for the item. Qty – This function is not currently used in the Manager's Work Station. Price – This field represents the price for the item. GM % - This field represents the gross margin for the item. Rev. Price – Use this field if the item is going to be changing prices and you know the date that the prices will change. Eff. Date – This field represents the date that the Rev. Price will override the regular retail price. Promotional Pricing – Use these options to set up sales for the selected item. This section will also contain sales that are set up in Sales and Price Bulletins. Qty. – This function is not currently used in the Manager's Work Station. Sale Price – Enter the price that the items will be sold for when the item goes on sale. GM % - This field represents the gross margin for the item during the sale. Begin Date – This field represents the date that the sale will go active. End Date – This field represents the date that the sale will no longer be active. Allow Food Stamps – Check this box if the item can be bought with food stamps. Prompt For Price – Check this box if you want the cashier to enter the price each time the item is rung up. Disable Discount Keys – Check this box if this item is not eligible for discounts. Subunit of Substitute # - Check this box if this item is a subunit of the substitute number (E.g. If this item is a pack of cigarettes and the substitute number is the corresponding carton of cigarettes). History – Check this box if you would like to have this items history saved on your Manager's Work Station. Subassembly – Check this box if this item is part of a bundle that can be sold under a separate PLU code (E.g. a monitor sold with a computer). Serial Item – Check this box if you would like this item to become serialized. Logical Deleted – This function is not currently used in the Manager's Work Station. Loyalty Discount Eligible – Check this box if the customer is eligible for loyalty discounts. Labels – Check this box if you have labels set up for this item. If you check this box when you receive this item, it will also go into the barcode label file to be printed later. Negative Price Items – Check this box if you would like to allow the item to be rung up as a negative price for returned items. Random Weight Items – Check this box if you would like the item to be weighed when purchased. Scalable Item / Tare # - This field is only used if you have a scale attached to your register. 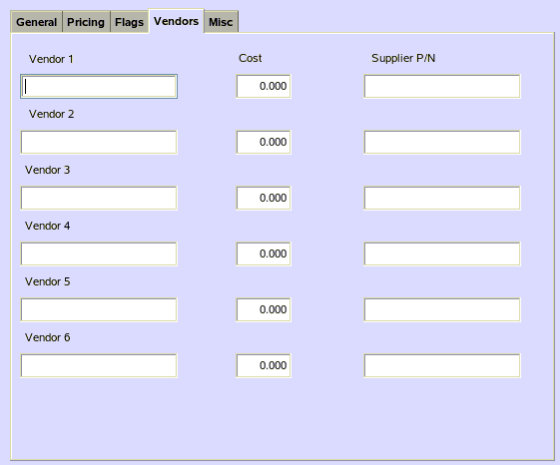 Vendor 1-6 - Use these fields to enter the vendors that the item comes from, these fields do not have to be filled out. 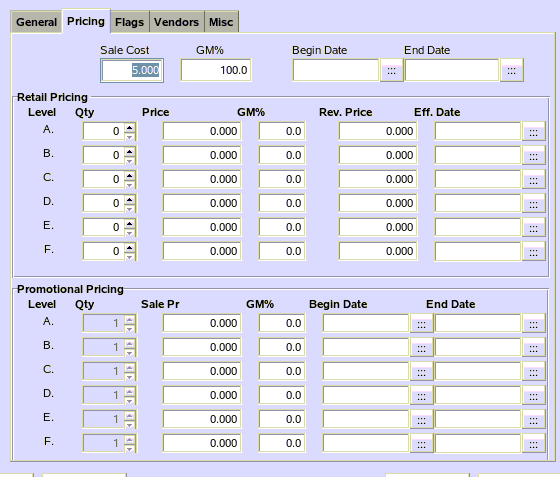 Cost – This field represents the cost of the item from the vendor. Supplier P/N – This field is used by the vendor to identify their product. Mix Match ID – Use this field to give this item a mix match code that will process discounts. This field is not required. Link Item – Use this field to link multiple items to be rung up when only scanning one item (E.g. when ringing up a hamburger, a bun will be rang up to correctly represent the price for a hamburger). Min Level – Use this field to set a minimum inventory level for this item, upon reaching this minimum level, the system will prompt you to create an invoice for the item that is low in stock. 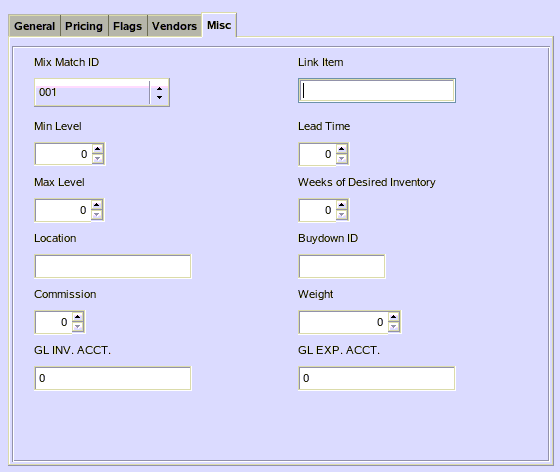 This field is also used if set up to automatically create purchase orders using min/max levels. Lead Time – Use this field to tell the system how many days it takes to receive your products after ordering them. Max Level – Use this field to set a maximum inventory level for this item. Weeks of Desired Inventory – Use this field to tell the system how many weeks of inventory you would like to keep on hand. 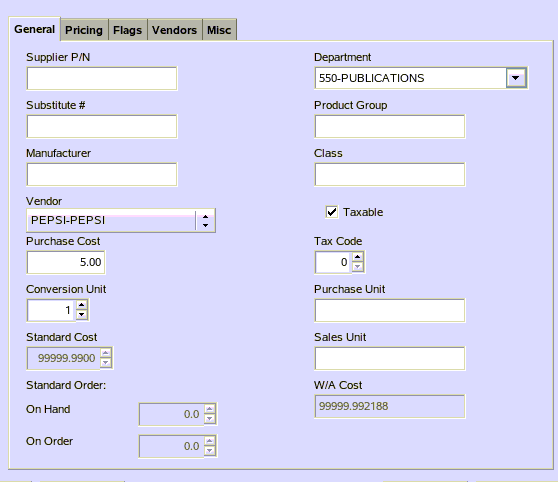 This field is also use when Purchase orders are automatically created. By using this field and the sales for that number of weeks, the system will create a purchase order to cause the stock to be at that quantity. Location – This is a user defined field that can be used to describe an item's actual location in a warehouse. Buydown ID – Use this field to identify the buydown ID. Commission – Use this field to define the commission rate that is attached to this item. Prev: What Are Department Fields? Next: What Are Auto-Field Change Fields?